Location: Store Home > MTX TP1100 Thunder Pro2 10" 2-Way "Free Shipping"
The MTX TP1100 Thunder Pro2 is built to last with a stainless steel grill and MDF box covered with aviation grade carpet. Thunder Pro2 speakers have an X-radial design, horn-loaded tweeter for crisper highs paired with the high excursion ported woofer configurations for better low frequency response. Mobility and setup are an ease with a lightweight design and easy grip handles. Reinforced and interlocking corner supports protect during moving and allow cabinets to be stacked when bigger sound is needed. 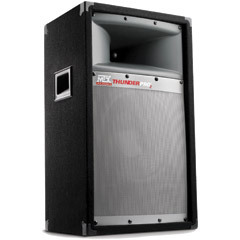 With a smaller size than other pro speaker lines, the ThunderPro 2 speakers have a long throw and wide dispersion. Can also be pole-mounted to raise the sound stage to ear level.. Specifications: • Power handling: 100 watts RMS/200 watts peak • Impedance: 4 ohms • Frequency response: 66 Hz - 20 kHz • Crossover frequency: 3.0 kHz • Sensitivity: 92.1 dB 1W/1m • Dimensions: 21" H x 13-3/4" W x 10-1/4" D. weight 24lbs.